Lennard Zinn takes questions related to gearing, along with follow-ups regarding frame fatigue and brakes. 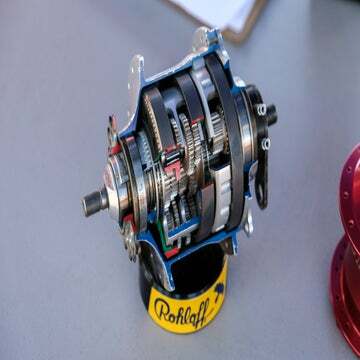 If I want to run some 6800 mechanical hydro shifters with an 11×42 cassette, what are my options? A simple question is lots of different avenues to answer. If I had Di2, this would be easy, but that isn’t happening. Would a combination of the new R8000 shadow RD work with Wolf Tooth’s GoatLink? I don’t have personal experience using that cassette with a Shadow rear derailleur, but I have closely related experience with non-Shadow Ultegra rear derailleurs that I think sheds sufficient light to answer your question with a high degree of certainty. 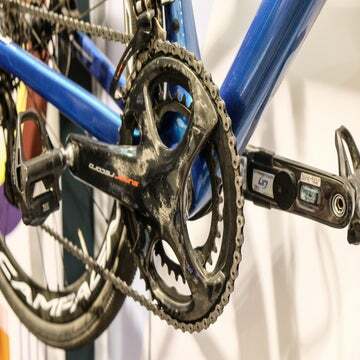 The short answer is that I think that the RD-R8000-GS Shadow rear derailleur will be able to handle that cassette, and a RoadLink or GoatLink 11 may be required. I had this Ultegra Di2 GS rear derailleur on one of my bikes for many years, and I used it with an 11-36 without any adaptations other than b-screw adjustments. It worked great, despite the fact that it is rated only to 32T maximum cog size. I am doing the same with this non-Di2 model on another bike. I also used these same derailleurs on 11-40 cassettes with the Wolf Tooth RoadLink, again with good shifting and no bumping on the largest cog. 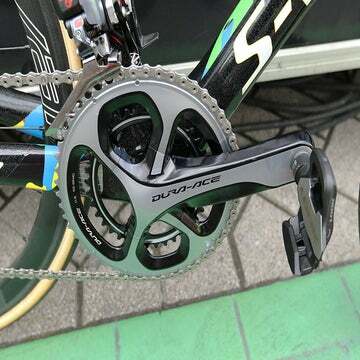 The length of the derailleur hanger differs on the two bikes, and the one with the longer hanger almost ran noiselessly on the 11-40 cassette without the RoadLink, so I’m sure some bikes would work with that combination with no further adaptation. Shadow road rear derailleurs have a capacity of two more teeth than their non-Shadow siblings. So, the RD-R8000-GS Shadow rear derailleur is rated to a maximum cog of 34T, where the 6800 was rated to 32T max. Given my experience with the 6800 and 6870 derailleurs rated to 32T handling an 11-40, I’m confident that the R8000-GS RD would work with the 11-42 with a RoadLink or with a GoatLink 11. I am planning a trip to Colombia partly to do the famed Alto de Tetras climb, which has over 13,000 feet of climbing in 50 miles. I am a bit concerned about doing this, particularly at altitude and with my winter fitness level. Low gearing will help. Do you think I can run SRAM eTap Wifli 11-speed with my 46-30 chainrings (Compass). If you do, then I will have a 30-32 low gear. The mid-cage (WiFli) Red eTap rear derailleur will indeed handle an 11-32 cassette (and possibly larger if you want to experiment). As for the eTap front derailleur, I think you’ll run into similar issues with any road front derailleur on such small chainrings. The curvature of the front derailleur cage is optimized for a 50-53T big chainring. If you use smaller chainrings, the problem is that the leading end of the cage is further away than optimum when the tail of the cage is just barely clearing the chainring. The leading edges of the front derailleur being close to the chainring is crucial for quick, accurate shifting. If you have gotten away with that 30-46 combo with a road front derailleur, then you know the issue. I suspect it will work well enough to get you through your Colombia trip, but it certainly will not shift as snappily or as flawlessly without chain drop as if you were running a 39-53 or 34-50. You will probably need to experiment with a slight twist to the front derailleur to avoid throwing the chain while still getting acceptable shifting. Just to set the record straight on Universal brakes, alloy racing side-pulls were offered from the late 1930s, were prevalent on Italian bikes until the early sixties, and were very much equivalent to any brake from Lam or Weinmann in the era. In 1961, Universal introduced model 61, the center-pull model to respond to the Mafac Racer, the dominant brake in the racing market until Campagnolo created their iconic brake in late 1968. The Universal mod 68 side-pull (not a coincidence) was their last high-volume offering, indeed lacking stiffness and refined finishing compared to its Italian competitor. Readers owning classic bikes from the 1950s or 1960s will want to know. Any of the common frame materials can be used to construct a frame that will last more than a human lifetime of riding by an arbitrarily heavy and strong rider over an arbitrary terrain and road surface. Such a “lifetime” frame will, however, be heavier than a frame of the same material built to last, say, 10 years for the same rider and conditions. A frame built to last five years will be still lighter. The lighter frames with potentially limited but “long enough” lifespans will be more attractive to “most” prospective buyers. I’ve raced since the early 1970s, worked in multiple shops, and earned a BS in mechanical engineering. I’ve owned and/or observed many steel and titanium frames that have suffered fatigue failures. While a steel or titanium frame may well be operating below the material’s endurance limit while “JRA,” it’s probably well above the limit when the rider hits a pothole during an uphill sprint or brakes hard on a steep descent on a washboard road surface. On a different topic, Universal made two different models of side-pull brakes that used their characteristic link-arm style of quick-release mechanism. The Type 51 had thin, gracefully curving arms and were generally of quite long reach. The later Super 68 brakes had arms shaped much like the Weinman 500. The 51 was quite flexy and the long reach meant that leverage and braking force was minimal. The Super 68s weren’t bad brakes, and while they obviously weren’t as good as the Campagnolo brakes, they also didn’t cost anywhere near the Campy’s outrageous $60 price (that was for the set including calipers, levers, cables and casing, and top-tube clips). The discussion of frame fatigue is very interesting. I stumbled on this Sheldon Brown page demonstrating a real-life fatigue test. The result seems to indicate that the real fatigue limits are mostly unrelated to material but design alone.